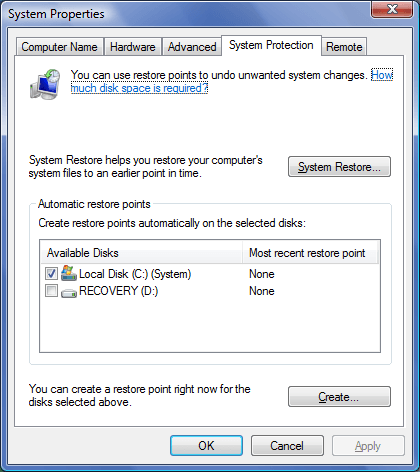 System Restore is a useful tool that you can use to reset your computer’s settings to an earlier time. It can be very helpful in times of crisis, when your computer fails to work as it should. However, you can only restore your computer’s settings if you have a valid restore point to set it back to. Although your computer usually automatically creates a restore point every time you install new software, drivers or updates, there’s no guarantee that it will. It’s wise to create a manual restore point before you major changes to your computer’s settings, install software or manually edit the registry. If turn System Protection off on a disk, all your restore points for that disk will be deleted. If System Restore fails to automatically create a restore point when you turn it back on, you should create a manual restore point. To use System Restore in Windows Vista, you must have about 300 MB of free space on your hard drive. Your drive must be larger than 1 GB and must be formatted using the NTFS file system, as System Restore cannot protect FAT32 or FAT file systems. System restore restores important files and settings such as system files, installed programs and registry settings. It doesn’t change your personal user files, such as documents, email messages or pictures, stored on your computer. Click the Start button, then right click Computer and select Properties. In the left pane, click System Protection. 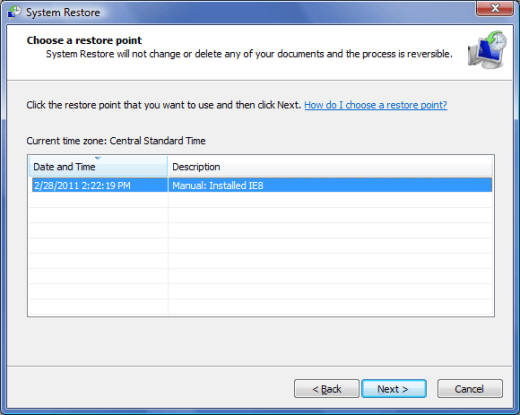 Under Automatic restore points select the drive for which you’d like to create a restore point. 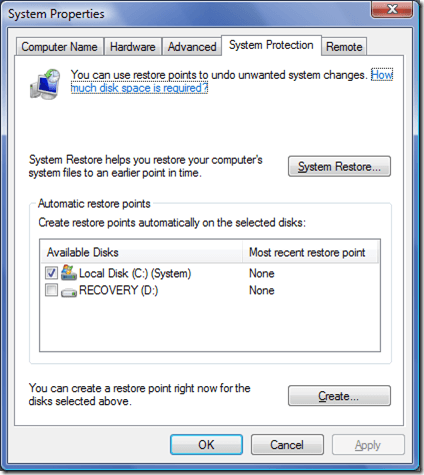 Beside You can create a restore point right now for the disks selected above, click Create. Type a description of the restore point in the field provided. You can use today’s date, or you can type a description of the changes you’re about to make to your computer. For example, describe the software you’re about to install or the edits you’re going to make to the registry. If it works, you will receive a message that the Restore point has been created successfully. Save your work and close all open programs. Click the Start Search box, type System Restore and press Enter. Click Next, then look in the window for your restore point. Your most recent restore point will appear. Select it and click Next. Review the information under Confirm your restore point and click Finish. 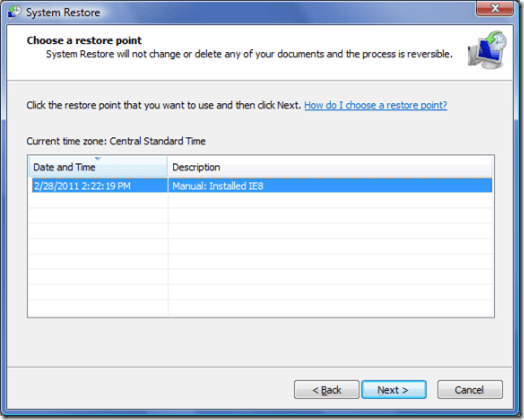 System Restore will now restart your computer to return it to the earlier state you chose. For more information, read How to enable or disable System Restore in Vista. What is MIDI and How Do I Use It?